I love breakfast. I thought this as I sat down to eat my freshly baked soda bread with scrambled eggs and bacon this morning. I don’t just love ‘special’ breakfast times, this week we have been sitting down every morning at 7am to eat breakfast together as a family. Normally we have had simple cereal and fruit or toast and fruit, but the act of eating together and eating the same things as Malachi has been really great. The fact that Malachi can eat such great things now for breakfast is awesome. We have had fruity pancakes, mini omlettes, freshly baked bread, different types of porridge, fruit salad and yoghurt, all of which are very tasty. But after a conversation I had with someone last week, which went along the lines of ‘you can’t give him that for breakfast’, I wondered if there were any foods that should be off limits for breakfast? Obviously breakfast food changes according to the culture in which we live. In the society in which I live it is considered normal to eat cereals as our main breakfast food, either made into bread or a porridge or a packet of ‘breakfast’ cereal, on special occasions we may have the traditional Full English fry up of bacon and eggs. But we don’t have to travel far for the breakfast foods to change, pop over to France and you have croissants, pain au chocolat or brioche, Spain and you have cafe con leche, magdelenas and churros, Germany and you have Brötchen with jam, marmalade, cheese and cold meats. Whilst these dishes are very different, they are not so different that we would think twice about eating them for breakfast, but what about if we get outside of Europe. If we travel to the Americas, then we have American pancakes, bacon and maple syrup, eggs, grits and waffles, Mexico you have chilaquiles, tacos, burritos and huevos rancheros, Cuba then you have strong coffee and corn bread. In fact many of the Latin American countries traditionally have strong coffee, fruits and bread as their main breakfast food. So the Americas are not so dissimilar to the European fare. If we travel to Africa, then the breakfast food changes a little although still bread or some type of porridge with tea or coffee seems to be a staple. There are some different breakfast options like in Tunisia you would find chakchouka (baked eggs in a spicy tomato sauce), in Egypt you may get ful medames (slow cooked fava beans), their national dish for breakfast, in Gambia you could get nyebbeh (beans in an oil gravy) or in Morocco then you could have harira (spicy soup). Whilst many of us may not think twice about eating these for our dinner, would we naturally put them on our breakfast table? When we get to Asia, then breakfast changes to what we may be used to. In China a traditional breakfast would include dim sum, crullers and congee, in Japan its traditional to have steamed rice with miso soup or natto served with green tea, in South India you would have idli, dosai and vadai’s served with sambar and chutneys. These dishes on the other hand, even may seem unfamiliar for dinner let alone having them for breakfast. However as a fan of breakfast and especially as a fan of Chennai, I would not think twice about eating dosa with potato curry and coconut chutney for breakfast. 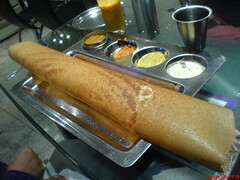 In fact the perfect dosa is one thing I crave when I’m not in Chennai, especially as I struggle to make the perfect crisp dosa. (Any tips or help would be greatly appreciated…) Thank goodness for a few good South Indian restaurants in the UK like Chennai Dosa, Ganapati and Saravana Bhavan. So my answer to the question at the start, is there any food that should be off limits at breakfast time? I think the answer is no! There is so much more to breakfast than cereal, different things are eaten all over the world. Maybe we just need to expand our horizons and try something new on our breakfast plate. Of course not not everyone has the option of eating breakfast, the statistics from the World Food Programme show that there are millions and millions of people in the world who are hungry. I have never experienced what it’s like to be really hungry, I have never experienced what it is like to be limited in food options, I don’ know what it feels like, but I’ve seen it and I’ve wanted to make a difference. I have made a difference, I have been travelling to Chennai over the last 12 years and I have been part of a team that has provided food for underprivileged children. I continue to make a difference by raising money to support those children. You could make a difference too. Try one of the recipes below and enjoy them, then give the cost of that meal to support someone in the world that doesn’t have the same options as you. Go on. Next: Next post: Come on….take on the challenge….